Contact Barski Law Firm PLC today to receive comprehensive debt resolution and asset protection solutions from our team of experienced bankruptcy attorneys. Get in touch with us by phone or email to get a free consultation. 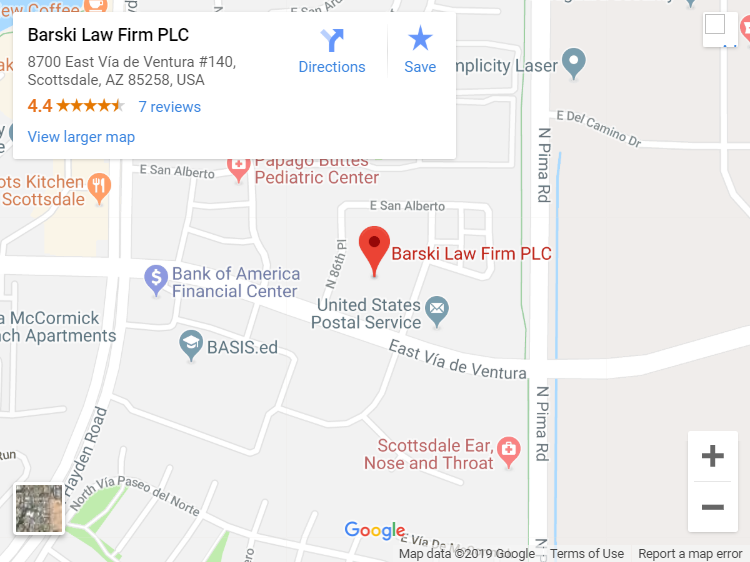 Barski Law Firm PLC has decades of experience delivering realistic bankruptcy solutions to individuals and businesses struggling with overwhelming debt. Each client’s financial situation is unique, and our bankruptcy consultation lawyers in Scottsdale, AZ ensure that you have an understanding of the best options for financial recovery. We will evaluate your case free of charge, devise the most suitable solutions, and proceed accordingly. Debt Relief – We offer debt relief programs to people who have fallen behind their credit card, medical bill, or loan payments but still have the relative means to repay their debts. This is an excellent alternative to filing for bankruptcy, given that the client fulfills specific requirements. Chapter 7 Bankruptcy – A client qualifies for Chapter 7 bankruptcy if he/she has limited means to repay creditors. This is ideal for holding off wage garnishments, avoiding judgment liens, and protecting any future income from creditor claims. Chapter 11 Bankruptcy – This applies to clients who wish to restructure their debts for more manageable payment plans but is ineligible for Chapter 13 protection due to exceeding the debt limits. Chapter 13 Bankruptcy – Only individuals can file for Chapter 13 protection, and only if that person has less than $1,184,200 in secured debt and less than $394,725 in unsecured debt. If you live in Scottsdale, AZ and need consultation from an experienced bankruptcy attorney, contact us today. You may also fill out our contact form to get a free assessment of your case.